We think many in our country are clueless; teachers in America are unheralded heroes, but hardly anyone realizes it. The vast majority of educators toil in obscurity, committed to nurturing children and rescuing them from lives of illiteracy and poverty. Except for an occasional award and limited acknowledgement within the profession, the critical work of maintaining our culture, of passing on our heritage and of providing all children, regardless of their race or life circumstances, a chance to realize their potential and exceed their destiny, this critical work fails to garner the respect and recognition it deserves, at least in this country. In similar fashion, even though most teaching positions require greater education and preparation than comparable work, those who accept the responsibility of reaching and teaching our young people are usually paid less than other professions and accorded less respect in our society. This is not true across the world; teachers’ work is recognized and compensated very differently in other modern countries such as Japan and Germany. Only in America could you make more money driving a bus or unloading ships than teaching. Heroic Teacher Press was incorporated in 2009 as a new small publisher of adult fiction with a mission to change these perceptions. As expressed in our mission statement, the focus of our company is to call attention to the altruistic accomplishments of teachers, both the mundane, unselfish efforts undertaken everyday by teachers on behalf of children as well as the life-altering, life-saving actions of educators that go largely unnoticed by society at large. Heroic Teacher Press will seek out and publish exceptional stories that portray the unheralded attributes and accomplishments of dedicated teachers throughout the U.S. We will select and publish manuscripts that capture the exciting drama in schools and are, at the same time, well-written and engaging and can connect with the reading public. Equally important to HTP is that the story selected be an effective metaphor to capture and portray the altruistic efforts of the thousands of exemplary teachers in classrooms across the country. It is our goal to use these works to popularize the concept of the teacher as the real American hero for the 21st century. 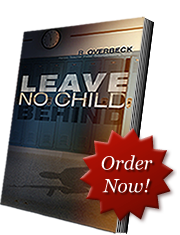 For this reason, we are thrilled to have R. Overbeck’s Leave No Child Behind as our debut book. This tale skillfully portrays Dee Dee Sterber as a believable, though fictional, hero-teacher. Dee Dee, like so many real teachers, knows and cares deeply for her students, and when her students are threatened by an unspeakable horror, she places herself in harm’s way to save them. In the stories, she does what thousands of outstanding teachers do everyday, she puts their needs ahead of her own. To further promote the concept of teacher-hero, we will also publicly recognize real American teachers who, through their unselfish dedication to their students, have already achieved true hero status. With the help of local and regional media, we hope to use this publicity to achieve greater visibility and notice for these individuals–both living and dead–for their contributions to their students and our country. Through our website and local radio, TV and print media, we will publicize these American Teacher-Heroes on a regular and ongoing basis. Also, we will provide students, parents, community members and colleagues with opportunities to nominate other educators for recognition as American Teacher-Hero status. Taken together, we believe our efforts can have a real impact. As a small press, we will publish outstanding fiction that every reader who has been in a school will be able to relate to, enjoy and be entertained. At the same time we will proclaim the truth–both though fiction and fact–that the teachers who nurture and motivate and educate our young people are the real American heroes and deserve to be treated as such.